Laminitis, also referred to as founder, literally means inflammation of the laminae of the hoof. 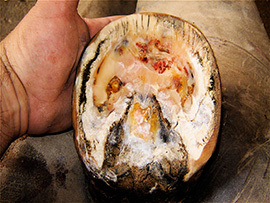 There are about 600 pairs of interleaved laminae: the epidermal laminae attached to the hoof wall and the dermal laminae attached to the coffin bone. 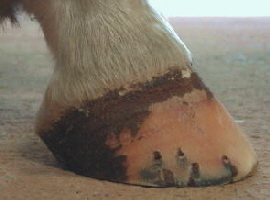 The damage to the hoof tissue can become severe and may cause rotation and sinking of the pedal bone. Standing awkwardly with more weight on hind legs, while shifting weight from one foot to another. Hooves may feel warm to touch with increased digital artery pulse rate. blood vessels have become constricted. thereby reducing oxygen and other nutrients to the hoof and laminal tissues. the laminae become damaged and weakened and pull away from the hoof wall. the pedal bone is no longer supported by laminal structure and begins to rotate and descend towards the sole. the tissue in the sole of the foot becomes compressed, more blood vessels collapse leading to further crushing and subsequent infection. Is there a cure for laminitis? Many equine experts believe so. They believe that the answer for laminitis is to deal with the root cause — which is insufficient power and energy within the cell. When there isn’t enough cellular energy left over after dealing with ongoing metabolism and other stresses from toxins and injuries then healing does not occur. From this viewpoint, healing takes place when SURPLUS energy exists. Healing does not take place when raw materials are available and not enough energy exists. Having cellular energy over and above the amount needed to maintain the life of the cell is the only way to cause healing to proceed. That is why healing normally only takes place during sleep when cellular energy requirements drop to a minimum and excess energy can then be used for healing. There is, however, a way to increase cellular energy by several times during the non-sleeping hours, too. The way to do this is to feed your animal alpha polysaccharide peptides or alpha glycans. This specialized type of food goes directly to the mitochondria without active transport and is turned into energy. All other curative efforts that ignore giving the cell extra energy dwindle in important next to dealing with the root cause of lack of healing, which is lack of excess cellular energy. Alpha polysaccharide peptides are the only sure way to increase energy within the cell. CN furnishes 100% alpha polysaccharide peptides and we highly recommend it’s use with equine laminitis. CN’s alpha polysaccharide peptides are a modern food miracle. They will increase net energy in cells significantly (up to 36 times more ATP output than from ordinary foods that have to be actively transported into the mitochondria). The additional cellular energy is the only thing that will allow the energy supply to exceed metabolism (use of energy) so that additional energy exists for healing heal the damaged tissues. Without surplus energy there is no healing, no matter what other techniques and nutrition may be applied.